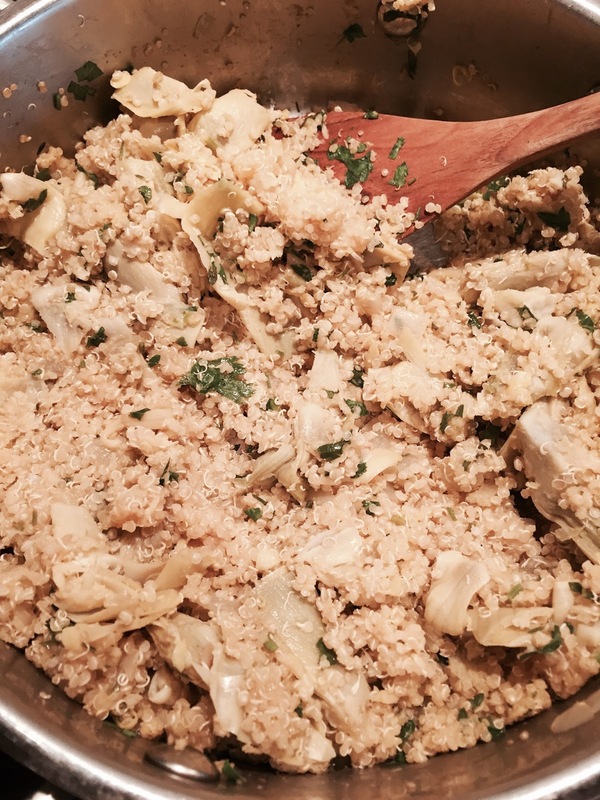 heather & olive: artichoke quinoa. The picture doesn't do this dish justice. At all. Sunday night my mom whipped up a delish dinner, and one of the menu items was artichoke quinoa--I'm a big fan of quinoa (I'll sometimes make a big batch on Sunday with pesto and chicken to bring to work for lunch), and I also have a longstanding love affair with artichokes. This recipe that combines the two does not disappoint. Heat oil in a medium saucepan over medium-high heat. Add onion and thyme; sauté 5 minutes or until onion is tender. Add artichokes; sauté 2 minutes or until thoroughly heated. Add broth and quinoa; bring to a simmer. Cover and cook 18 minutes or until liquid is completely absorbed. Remove pan from heat. Stir in parsley, rind, juice, and salt. Top with parmesan cheese if desired. Serve warm or at room temperature. Note from the chef -- I doubled the broth and quinoa (2 cups [vegetable] broth, and 1 cup uncooked quinoa). I think it made the dish a bit heartier, and it certainly provides lots of leftovers!